High-throughput screen and counter-screen for activators of compromised tethered-peptide-agonist GPR56. (A) Schematic of the tethered agonist region of GPR56 7TM in comparison with the tethered-peptide-agonist-compromised GPR56-A386M 7TM receptor and alignment of the GPR56 activating peptide (P7). Artificial initiator methionine placements are shown in red. (B) Optimization of the high-throughput screen was performed in a 384-well plate with increasing concentrations of TYFAVLM (P7) peptide. The data are the mean ± S.D. of 16 replicates. Z′ assay quality scores were calculated for each concentration of TYFAVLM (P7) peptide tested. HEK293T cells transiently transfected with the SRE-luciferase reporter and the (C) GPR56-A386M 7TM (high-throughput screen) plasmid, or (D) empty vector (high-throughput counter-screen) were seeded into wells containing ∼3–5 μM DMSO-solubilized compounds from the Spectrum Collection. Luminescence was measured after an 18-hour incubation period. Each point represents one individual compound tested. 3-α-Acetoxydihydrodeoxygedunin is a small-molecule activator of GPR56/ADGRG1. (A) Chemical structure of 3-α-acetoxydihydrodeoxygedunin (3-α-DOG) side-by-side with a generalized skeleton for the limonoid class. 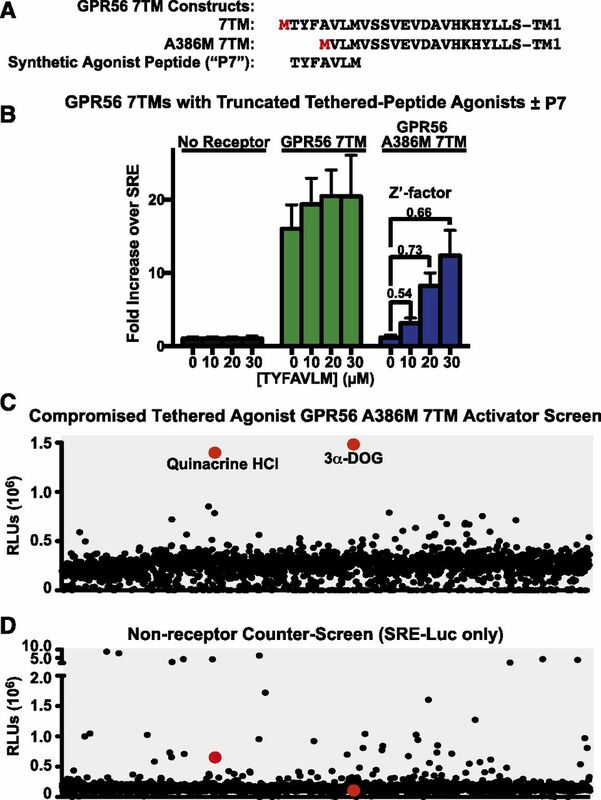 (B) Comparison of the tethered-agonist regions of engineered GPR56 7TM receptors. (C) GPR56 7TM receptors with intact (7TM) or truncated tethered-agonist residues were treated with vehicle (blue bars) or with 5 μM 3-α-DOG (red bars) in an SRE-luciferase gene reporter assay. Data are normalized to Renilla luciferase control and expressed as fold over the signal obtained from cells transfected with SRE-luciferase only. Error bars are the mean ± S.D. of three biologic replicates with two technical replicates per experiment. (D) GPR56-A386M 7TM (truncated tethered-peptide-agonist) and GPR56-H401M 7TM (no tethered-peptide-agonist) receptor membranes, or control, nonreceptor membranes were reconstituted with purified, recombinant Gα13 and Gβ1γ2. Membranes were preincubated with 3-α-DOG or DMSO for 5 minutes. [35S]GTPγS binding to G13 was then measured over time. Graphs were fitted to monoexponential functions using GraphPad Prism. Error bars are the mean ± S.D. of three experimental replicates with two technical replicates per experiment. 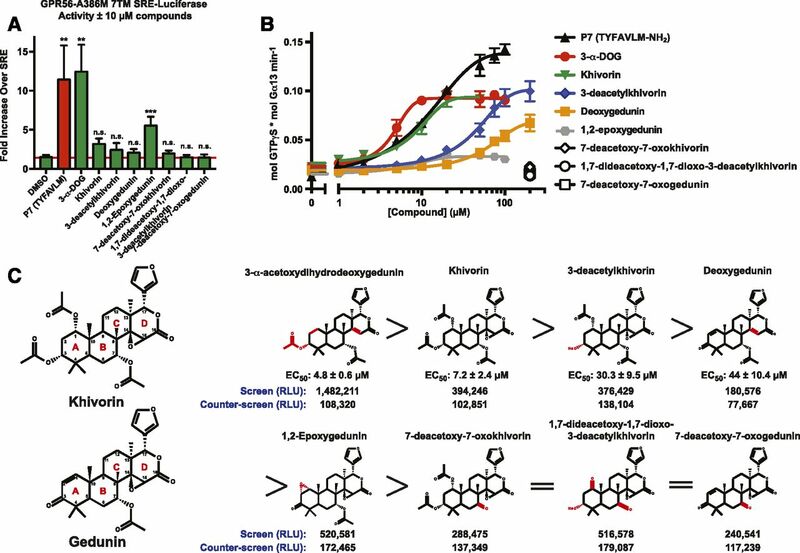 3-α-DOG-mediated activation of A386M 7TM and H401M was significant compared with control, DMSO-treated receptor (*P < 0.05; **P < 0.01; ***P < 0.001; ****P < 0.0001). 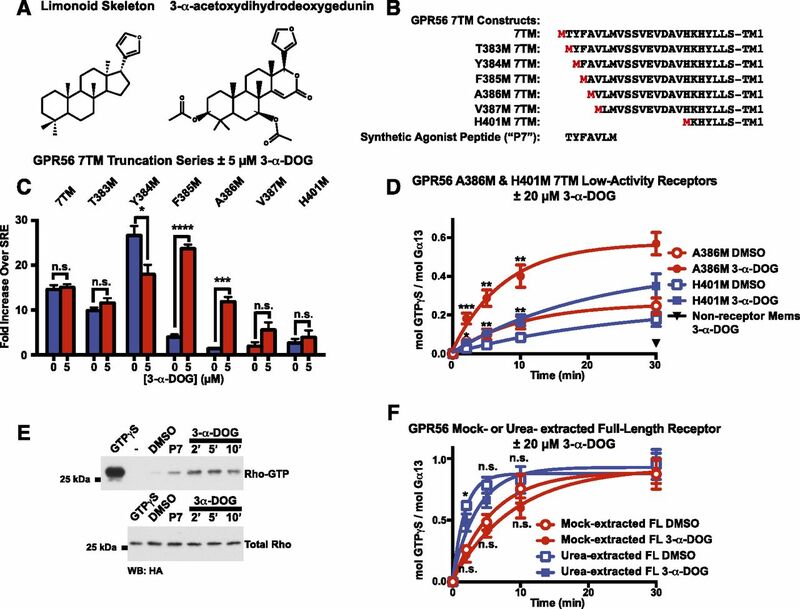 (E) RhoA activation by acute treatment of GPR56-A386M 7TM-expressing HEK293T cells with 3-α-DOG or P7 synthetic peptide agonist. The Western blot is representative of three independent experiments. (F) Untreated and urea-treated GPR56 full-length membranes were reconstituted with Gα13 and Gβ1γ2 and preincubated with 0 or 20 μM 3-α-DOG prior to measurement of G13 [35S]GTPγS binding kinetics. Error bars are the mean ± S.D. of three experimental replicates with two to three technical replicates per experiment (*P < 0.05; n.s., not significant compared with cells treated with DMSO). 3-α-Acetoxydihydrodeoxygedunin GPCR specificity. (A) Schematic of the full and truncated tethered-agonist regions of GPR56/ADGRG1, GPR114/ADGRG5, and GPR110/ADGRF1 receptors. 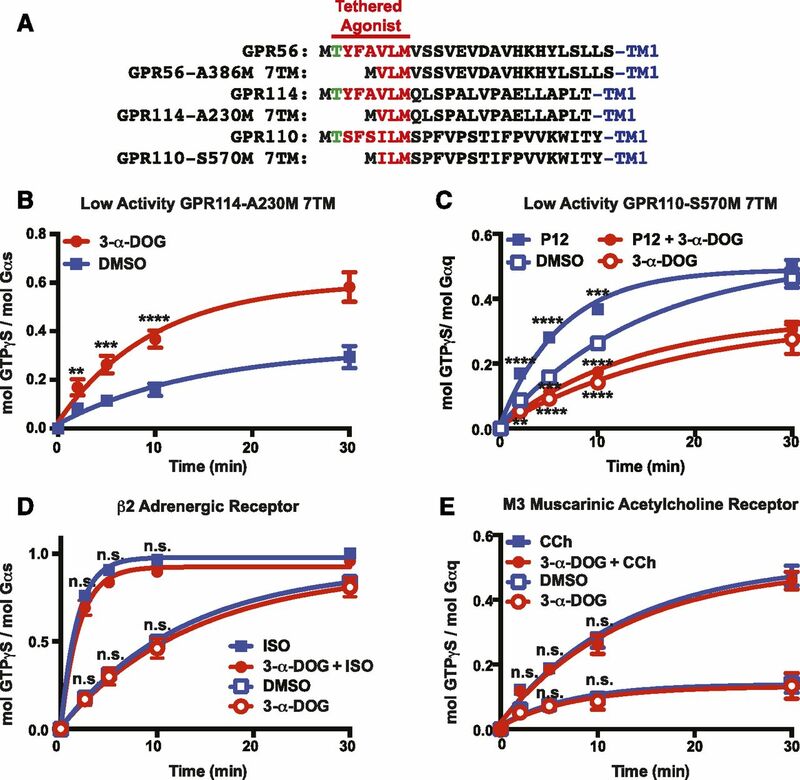 The kinetics of G protein activation were measured in the presence of 0 or 20 μM 3-α-DOG for (B) GPR114-A230M 7TM and Gs, (C) GPR110-S570M 7TM and Gq, stimulated with or without synthetic peptide agonist (P12, TSFSILMSPFVP), (D) β2 adrenergic receptor (β2AR) and Gs with vehicle or 10 μM isoproterenol (ISO), and (E) M3 muscarinic acetylcholine receptor (M3R) and Gq with vehicle or 50 μM carbachol. The data were fitted to one-phase monoexponential association functions using GraphPad Prism. Error bars are the mean ± S.D. of three experimental replicates with two to three technical replicates per experiment (**P < 0.01; ***P < 0.001; ****P < 0.0001; n.s., not significant compared with cells treated with DMSO). 3-α-DOG is a partial agonist. 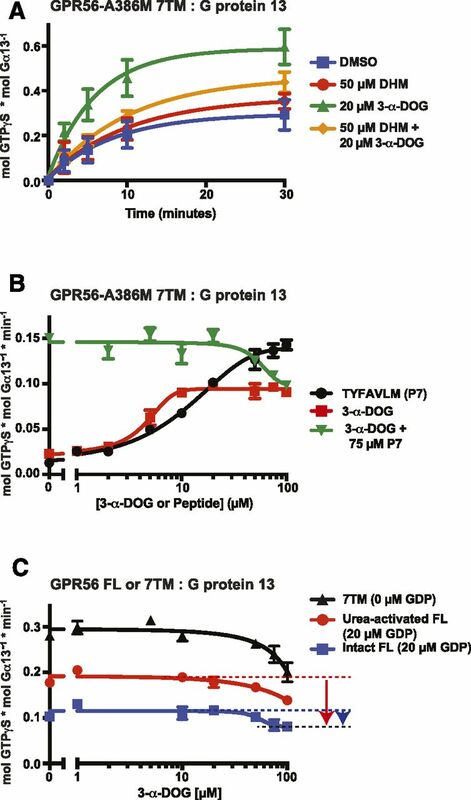 (A) The kinetics of GPR56-A386M 7TM-stimulated G13 GTPγS binding were measured in the presence of 3-α-DOG, the GPR56 GPCR antagonist, DHM, or both compounds. Error bars are the mean of three to four independent experiments with two to three technical replicates per experiment. Statistical analysis of the 2-, 5-, and 10-minute time points indicated from the 3-α-DOG-treated receptor was significantly different (P < 0.01) than DMSO-treated receptor. For 3-α-DOG and DHM-treated receptor, at 2 minutes, P < 0.01, and at 5 and 10 minutes P < 0.05, compared with 3-α-DOG-treated receptor. No significant difference was observed between DMSO-treated and DHM-treated receptor. (B) The initial linear rates of GPR56-A386M 7TM-stimulated G13 GTPγS binding were measured in the presence of the indicated concentrations of P7 synthetic agonist peptide, 3-α-DOG, or 3-α-DOG with a fixed EC100 concentration (75 μM) of P7. (C) GPR56 7TM (full tethered agonist) or full-length GPR56 kept intact or urea-activated were reconstituted with G13 and treated with increasing concentrations of 3-α-DOG. The initial activation rates were plotted as a function of 3-α-DOG concentration. For initial rate experiments (B and C), error bars are mean ± S.D. of the activation rates of three technical replicates. Structure-activity relationship analysis of gedunin- and khivorin-derived natural products. (A) GPR56-A386M 7TM with indicated compounds in 10 μM concentration activated SRE-luciferase to varying degrees. Data are the mean of four individual experiments with two-three technical replicates per condition ±S.D. (**P < 0.01; ***P ≤ 0.001; n.s., not significant compared with cells treated with DMSO). (B) The initial linear rates of GPR56-A386M 7TM–stimulated G13 GTPγS binding were measured in the presence of the indicated concentrations of individual compounds or P7 synthetic peptide agonist. The potency (EC50) of each compound was estimated from semi-log plots of one-phase monoexponential functions generated using GraphPad Prism. Error bars are the mean ± S.D. of three experimental replicates. (C) The chemical structures of khivorin and gedunin parent compounds are presented with the carbon atom numbering scheme. Capital letters refer to each of the four aromatic rings. The structures of the khivorin and gedunin derivatives are presented alongside the potency rankings attained from the G13 GTPγS binding experiment and the raw values (n = 1) from the high-throughput screen and counter-screen of GPR56-A386M 7TM. Red coloring indicates locations where the compounds differ from the parent compound (gedunin or khivorin).